Century City Mall P2K Rebate ~ Philippine Freebies, Promos, Contests and MORE! Century City Mall has something in store for you this weekend. 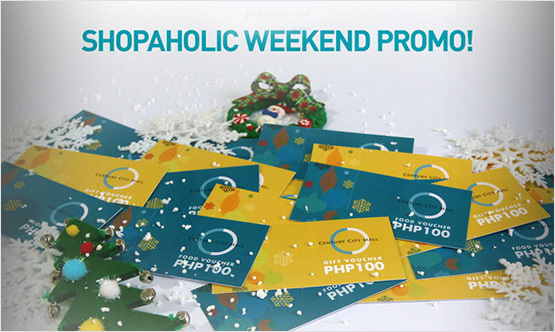 Check out their Shopaholic Weekend Promo where you can get a P2,000 worth of GC for every P10,000 spend in single or accumulated receipts in any establishments inside the mall within November 29 - 30, 2014 only. The Gift certificates may only be used at Century City Mall Shops and cannot be used on the weekend but is valid until April 30, 2016. Every P10,000 spent on each of the following dates: Nov 29, 30 in single or accumulated receipts from Century City Mall establishments entitles 2,000 people P2,000 worth of gift vouchers. Gift Vouchers can be redeemed at Century City Mall concierge desk located at the ground floor level during the promo period. To redeem, present valid store receipts dated only during the promo period, November 29 & 30. Concierge personnel shall record Mall guest details (i.e. name, address, company, & email). Mall guest shall be requested to sign upon issuance of Shopaholic Weekend Voucher for validation purposes. Maximum of 5 redemptions for a single person only. Redemption of an amount of P2,000 worth of gift voucher is equivalent to 1 redemption, thus a single person can only redeem vouchers at the total amount of P10,000 worth of gift voucher for the entire promo period. Gift vouchers may be used only in Century City Mall establishments. P1,000 usable in stores under the category Food &Beverages (F&B) which include all dining establishments selling perishables. P1,000 usable in all stores except those under the category F&B (Grocery is considered non-F&B) and Howards Storage World.